Emily graciously invited me to share the following excerpt from a recent article I wrote for ImagiNews. The voice said “GO.” I tried not to listen. A few years ago that strong voice of knowing informed me I needed to move on from places in my life that had come to fruition. It was time to venture into new territory, plunge deeper into passion, expand my vision and creativity. I barely had time to grab my pen as I was marched down a magical path called fiction writing. The voice said “GO.” I tried not to listen. Oh, how I tried. But my Inner Writer, cloistered far too long in an empty white room, banged on the walls of her cell. “Let me help for a change.” She cried. “…for a change.” The words struck home. I heeded her call. 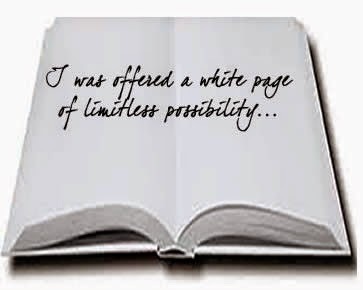 I was offered a white page of limitless possibility after years of writing medical chart notes. Feeling immensely liberated I naively stepped into the delicious vast emptiness that was mine, all mine, in which to create – and promptly ran wham bam into the limits of my Imagination. If you’ve never had the experience of writing fiction, be forewarned. There are no parameters as there are in non-fiction. When you enter the realm of limitless possibility there is no guide BUT Intuition. You will probably get a bruised nose, the result of constantly bumping up against your limits. That is good. Because once you know your limits you can invoke your Intuition to formulate a plan to move beyond them. Fiction writing offers the most brilliant, severe, jaw-dropping, bring-me-to-my-knees insights I have ever experienced. It can be fierce at times yet offers a deeper, more intimate, level of Intuitive connection. Each new scene illuminates a different facet of the jewel that is life. It helps us see and understand treasures that lie within each of our lives, sometimes bright and shiny, sometimes barely visible beneath the dust; sometimes submerged so deep we can only imagine they are there.